I made a video on how I bathe and groom Nina since we moved here. 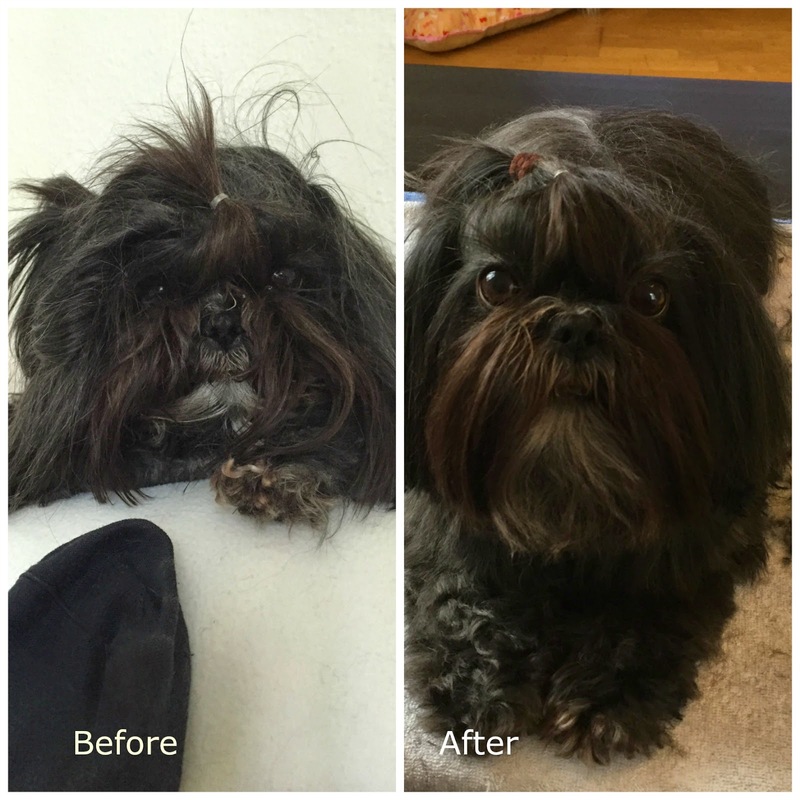 In Brazil, she and Peepow went to a groomer every week, which is very common there. I do this in the living room. I put a towel on the table, plug the hair dryer and set combs and brushes. I clean the bathtub, put a bench to sit on close to it, the towels by my side and turn the heat up. I forgot to talk about the cotton balls in the video. It is a very important step! But even with the cotton balls, you have to be very careful with the ears. I use the "champagne" option on the shower head, because it is soft and comfortable. I like to shampoo, rinse, shampoo and rinse. The first rinse is very dirty, so I prefer to do it twice. I like to condition the whole body, wait about a minute and rinse it. It really helps to remove matting and the fur is more beautiful afterwards. This is one of the best ideas I've had for the process. I buy them at the supermarket, at cleaning section. They are a lot better than regular towels and make the whole drying a lot easier. After the microfiber cloths, I practically only need to use the towel to wrap her up and take her to the living room. I don't have a support for the dryer, so I prefer to brush and remove knots before using it, when I still have my two hands free. If I can't remove tangle/matting with the combination of brush, comb and fingers, I cut it out. I use my regular dryer, but there are models designed for animals. This part is the worst and it feels like my arm is going to fall off after a while. This is the most difficult step! I don't have any training in grooming, so I don't know the proper technique to get the results I want. I use scissors and basically reduce the amount of fur on her belly, paws and legs and shorten the fur on the head/ears. I use mini elastic bands proper for this and a kind of soft fabric human elastic. I hope you enjoyed this and that it is helpful to you!